lived a group of honey folk. high above the forest ground. lived inside that giant tree. that squirrel took their shells away." High up in an old oak tree, Perk and Bing live happily in their sticky beehive. The busy bees collect honey in acorn shells but throw away the nuts within. One day, they're dismayed to find their acorns missing. Who would steal them and why? 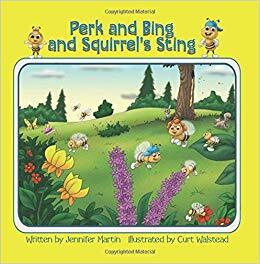 Help Perk and Bing solve the mystery and join them as they learn about caring, sharing and friendship. Vibrant, charming illustrations and fun, flowing rhyme will delight and entertain children of all ages. An extensive, illustrated pre-teaching glossary is included at the end of the book. This colorful five-page teaching tool will help parents and educators introduce and expand upon vocabulary found in the story. Eight enjoyable, illustrated follow-up questions will keep children smiling as they relive the story and test their memory. This whimsical, yet educational tale will help children see the importance of kindness, generosity and compromise in relationships. Jennifer Martin has been a teacher for more than twenty-six years and thoroughly enjoys incorporating educational and entertaining storybooks into her curriculum. She currently resides in Southern California with her supportive husband and their two playful pets. Watch for further Perk and Bing adventures. Award winning illustrator, Curt Walstead, studied illustration at Pasadena's Art Center College of Design. He has worked as an animation storyboard artist and illustrator for over twenty-five years and has illustrated numerous children's books. His impressive resume includes such shows as Dora the Explorer, Dragon Tales, Baby Looney Tunes, Clifford's Puppy Days and many other popular children's shows. He also resides in Southern California with his lovely wife and is currently working as a freelance illustrator and plush toy designer.